Challenged to compose their own poems about the Leeds bid for European Capital of Culture 2023 (Leeds 2023), local primary school children showed that creativity is alive and well in the city. 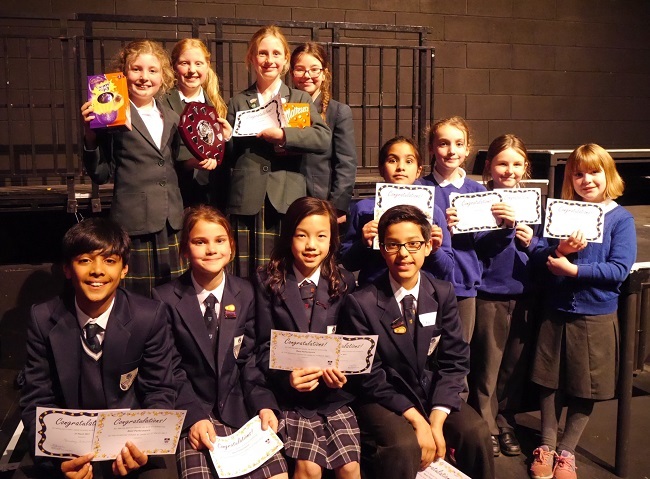 Taking part in the sixth annual Speak Up poetry day at The Grammar School at Leeds (GSAL), four Year 5 pupils from each of seven schools enjoyed a day-long poetry workshop before performing in a poetry slam for family and friends in the evening. Working with professional poets Khadijah Ibrahim and Rheima Robinson, of Leeds Young Authors, the children learned about the process of creating poetry, looking at writing devices, imagery and mood, and reading the work of other poets, before putting pen to paper themselves. The poetry slam in the evening involved two rounds. First each team performed a poem, either Love after Love by Derek Walcott or Imagine by Khadijah Ibrahim and Saju Ahmed. In round 2 they performed their own compositions on Leeds 2023. Also taking part in Speak Up were pupils from Beeston Hill St Luke’s C of E Primary School, Westgate Primary School, Otley, Swarcliffe Primary School and St Chad’s Primary School. Visit our Facebook page to read The Beating Heart of Yorkshire by Anoushka, Leo, Stanley and Trang from GSAL Junior School.